Sand Making Machine ( VI Series Vertical Shaft Impact Crushers ) have another name called Sand Maker, which is high-performance equipment for sand making and shaping, is researched and produced by our corporation through absorbing the advanced technology from Germany, and has achieved world advanced standards. This equipment has two types: rock-on-rock and rock-on-iron. 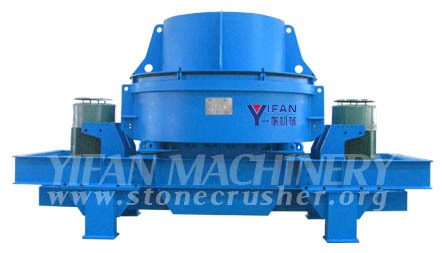 Sand yield of “rock-on-iron” type is higher by 10-20% than that of “rock-on-rock” type. 2.The number in the brackets is applicable to low abrasive material. 3.Hydraulic decap and automatic lubricating device are optional configuration. 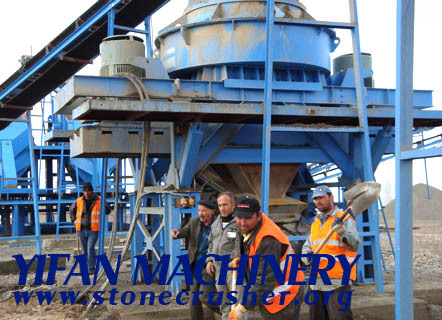 download the brochure to get details about Sand Making Machine.